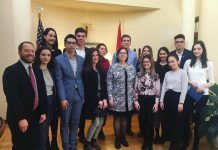 On February 13 and 27 Andrija Anzel ’14 conducted a two-part workshop on human rights titled ‘Let Human Rights Put Lights’ for 70 students representing four high schools of Paracin, Serbia. 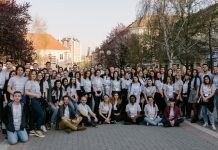 The first part was a human rights conference which was organized in partnership with the Union of Secondary School Students of Serbia and held in Hotel Petrus in Paracin. The venue for the event was provided for free. 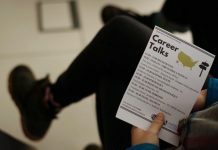 The guest speakers, FLEX alumni Tara Djelic ’08 and Igor Zlatojev ’07, and a union representative Kristina Marjanac talked about human rights’ situation in the region and implemented a range of activities. Thus, in a game aimed to highlight the dangers of systematic disenfranchisement Igor Zlatojev divided students into two groups and assigned both the same task but with very different set of rules. Not surprisingly, the team with less restrictions won the game easily. ‘Instead of presenting conventions and international treaties, I tried to show how human rights are applied in daily practical situations and brought the discussion to a level that everyone can understand,’ says Igor. The second activity titled ‘Portable Wall’ gave 30 local students an opportunity to express their views on human rights’ issues in their communities. 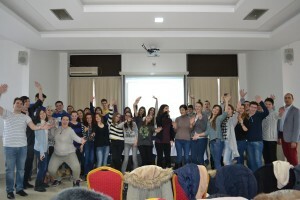 The Youth Association of Paracin hosted the event and provided logistical support. The FLEX alumnus estimates that in total the project has reached around 900 people living in the area and hopes that the participants will follow up with their own initiatives. He is confident that the human rights’ knowledge gained at the Eastern Europe FLEX-Ability Workshop helped him to make this project possible. Andrija has also been interviewed about the project by a local TV station.